Lady Dual Time GMT- This is the best timepiece for traveling from coast to coast or for traveling the world. It is a stainless steel case, with a big date, 37mm, automatic movement, blue mother pearl diamond dial. This watch displays to seperate times on the dial, the 10 shown is the second time zone and is displayed in military time (e.g. 24:00 hours). 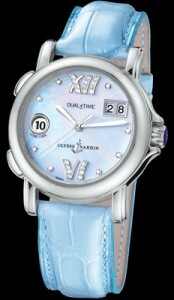 Available on a matching blue leather strap with regular pin buckle.